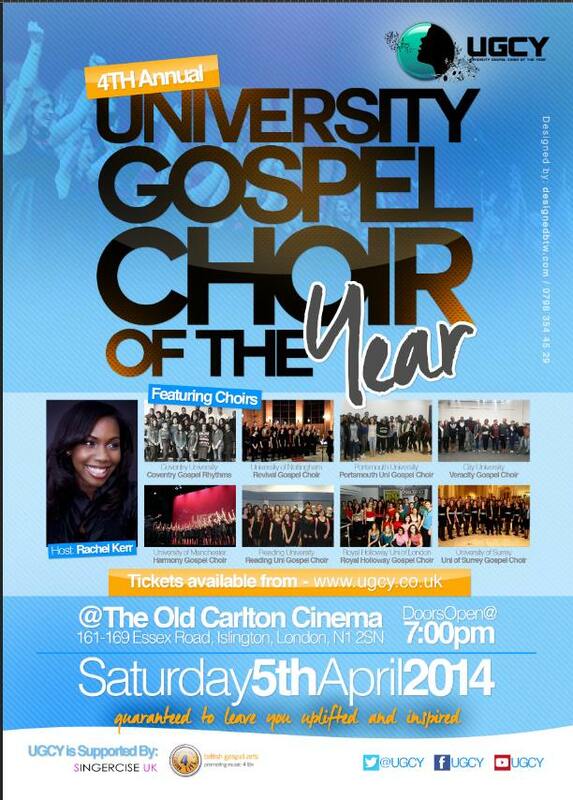 The fourth annual University Gospel Choir of the Year competition returns on 5th April 2014. Following the success of three previous shows, the Old Carlton Cinema, Islington will play host to this year’s proceedings. After achieving success with The X-Factor, Your Face Sounds Familiar, the BBC Gospel Proms and a world-record breaking attempt at Europe’s largest shopping centre, Westfield Stratford, UGCY is aiming to stage the most spectacular show yet. Resident host and MOBO-Award winning singing powerhouse Rachel Kerr returns to compare the finals with her usual grace and charisma. For the first time last year, the UGCY title was retained by Manchester Harmony Gospel choirs and return again this year to defend their crown. Judges Andrea Encinas, Mark De-Lisser and Stephanie & Ayo Oyerinde return to preside over the final decision as to who will be crowned University Gospel Choir of the Year champions 2014. Movers and shakers in their own right in the UK Gospel scene, for the very first time this year, our judges will also act as mentors to each of the choirs. UGCY is proud to be able to continue to provide this unique platform for fresh talent from the best and brightest of the UK’s universities to shine and elevate the Gospel. There are limited advanced early bird tickets priced at £12.50 available until Friday 28th February. Standard ticket prices are £15.00 thereafter. Buy 4 tickets for £50.